Happy Mother's Day Mom! I wish you a wonderful day filled with lots of love! The card below is just a small token of my appreciation for you! Happy Mother's Day to all you crafty mom's out there! A darling card with such a n adorable image!Love it! Adorable Mother's Day card! Thanks so much for joining us this week at The Pink Elephant! Such a lovely card! Very cute! What a sweet Mothers' Day card! Thanks for linking it to Cut it Up Challenges! 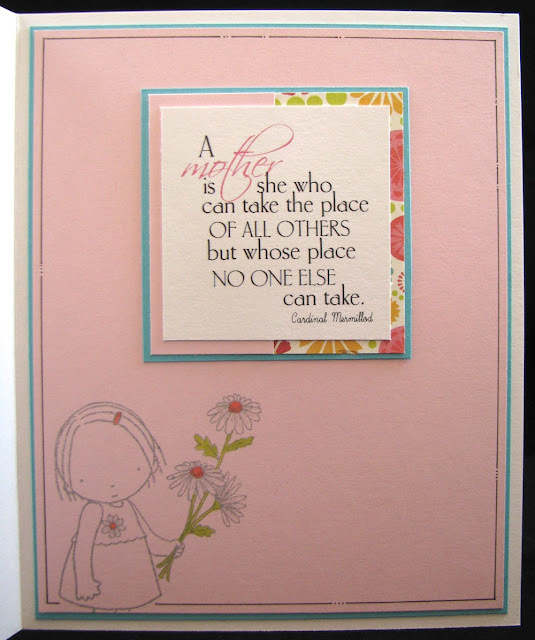 Very beautiful card...Thanks for sharing over at Cuttin and Stampin. Such a cute card! I love that her skirt matches the patterned paper background! Such pretty flowery papers, and a sweet image - I love the echo on the inside! Thanks for playing along with us at Our Creative Corner.